Welcome to the first daily betting tip for the ESL Pro League Season 8 Finals. All sixteen teams will be playing their opening Best-of-One game. Though many games will be one-sided, a few, in particular, are safe and profitable. BIG winning over INTZ will be the first recommended tip of this event. BIG, currently ranked 9th in the world, is a European organization that made it to the ESL Pro League finals by placing 3rd in the online season. Besting higher tier teams like FaZe, NiP, and Mousesports. INTZ is made up of the majority of FNX’s own Não Tem Como lineup. With Xand and Horvy being direct replacements for FNX and Bit. This team is currently ranked 39th in the world and has only played against lower-tier South American teams and made it into the ESL Pro League finals in the last available spot. BIG has an advantage in this matchup because of the level of competition they have been facing in recent form and total map pool dominance. On every available map, BIG has a higher win percentage than INTZ, with the only exception being Cache which will likely be banned out by BIG. 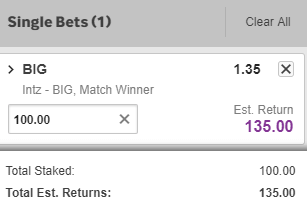 Betting tip / prediction: BIG to take the Win.